Colgate has had a rocky relationship with new technologies over the past few years. My freshman year, wifi cut in and out in my third floor Curits room and speeds fluctuated throughout campus. Things just didn’t feel consistent, steady, or complete. I mean, the only things ITS is doing to educate people about automatically backing their files to the cloud is a poster that hangs in the room behind the help desk, out of view from students. However, things have been on the upswing now, with the school offering services like Lynda, web print, and the new media lab on the fifth floor of Case library. Our university is finally getting into the mobile space as well, with two new apps: Colgate Alumni app and the Colgate app. While the Colgate Alumni app is available in both the iOS and Android app stores, the Colgate app is currently in beta testing, with a handful of people testing it out in order to get the kinks smoothed out.As a disclaimer, this app is NOT final and any problems I find with the app very well may be ironed out by the time it is available to the wider student body. When you open the app, the icons, which can be rearranged by clicking the customize at the bottom, dictate what this app can do. This app is a portal to the useful things that are found across four web destination that students visit: the Colgate website, the Colgate portal, Moodle, and Gatecard management. 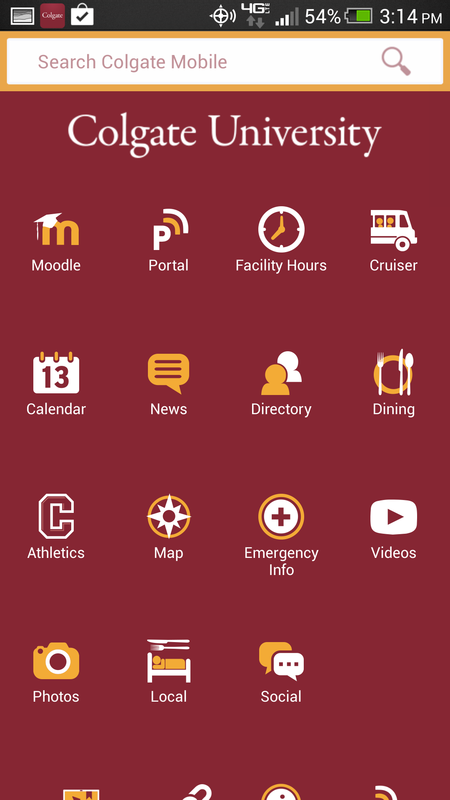 In that vain, the app’s different categories are Moodle, Portal, Facility Hours, Cruiser Schedule, Calendar, News, Directory, Dining, Athletics, Maps, Emergency Info, Videos, Photos, Local, and Social. Currently, the Gatecard section is missing, but I have been told it will be in the final version. Some of these, like Local, are pointless. Everybody with a smartphone has either Google Maps, Yelp, or some other, more robust way of finding places to eat. To a lesser extent, the Map feature is pretty useless, too. The app’s Map is powered by Google Maps, so if you also have the Google Maps app on your phone (if you don’t, download it now; it is far better than Apple Maps), you can search for the same places on Colgate’s campus. However, other sections are fare more helpful. I use the Moodle section the most and it offers a superior interface to the mobile web page. The best part is that I can actually view my the titles of my courses, which, if you’ve ever used the mobile website, know how frustrating the course title links are. While documents and PDFs are easy download, not everything is buttery smooth. If there are more than 10 files within a ‘Topic,’ the app directs you to the web browser to a web page that does not load. While this should be a quick fix, the app should not be sending users to an external web page if there are more than the paltry limit of 10 files; I hope that can be changed. The Facility Hours section is simple yet strikingly helpful. It lists different facilities by day and a swipe left or right will take you to the next day or the previous day respectively. The ingenious part is the small circle next to each of the facilities that is green if the facility is open and grey with a line through it if it is closed. The Cruiser schedule is nice to have on your phones, since it is ordered in regards to time as opposed to line; furthermore, the times are dynamically updated and only show times that are during or after the current time of day. Athletics and Directory and notable mentions as well, with the first allowing you to see the schedules of sports teams and follow your favorites, while the latter allows you search the whole Colgate directory easily, showing you mail box numbers and email addresses of students and phone numbers and office locations for professors. Overall, the app is a great start and I can’t wait for the kinks to be smoothed out. If it works this well for a beta app, the final product should be ready useful for the Colgate population. Update 11/19: The app has officially been released in the iOS app store and in Google Play. None of the problems that I pointed out have been addressed yet.